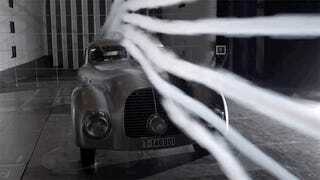 It took Mercedes-Benz Classic three years to rebuild the 1938 540 K Streamliner they found in a warehouse back in 2001. Thankfully, they documented the process, and the result is this 45-minute flick that shows how the Streamliner went from a jumble of parts to 115 MPH. It’s great to see Mercedes still being able to talk about the construction of the Autobahn and chasing speed records without mentioning the Nazis once. That being said, it’s also great to see that having the biggest archive in the industry and maintaining one of the best automotive museums in the world pushes them towards undertaking such major restorations. Having the plans for a one-off like the 540 K Streamliner in your basement is one thing. Another is finding a bloke who saw the car back in 1938 and can explain why the plans don’t exactly match the car seen in the archive photos. Recreating a handbuild aluminum body still requires some Italian craftsman, and in the end, the freshly-made, but period correct, set of Dunlop tires will decide whether this amazing Mercedes can do 185 km/h 77 years after its original debut.